Inspirations for a Daisy-Themed Wedding | Get Me To the Chapel! So, my aunt is getting married! I’ve actually known for a while, but I’ve started looking for stuff for her to fit her theme, and there is so much out there and it is all so beautiful. She wants a daisy-themed wedding, and has said that she’d like to get married in May. She’s such a carefree, beautiful person, and she has modeled her entire wedding after her personality. I can only describe what she has decided on as bohemian, because she wants it outside, with bare feet, simple sundresses for the bridesmaids, and lots of daisies! In May of last year, I went with her and her now-fiance to look at a place to have her “maybe” wedding. See, he’d asked her before, but she said no because she just wasn’t ready. She’d been married before, and I think she just had a fear of experiencing something bad all over again. BUT, she finally realized that she has found herself an amazing man, and he asked her again and this time, she said yes. So happy for her! They are such an amazing couple. They have a great sense of humor, and remind me so much of Jason and myself. Anyway, I decided to put together this little dose of inspiration for her…and anyone else who may be planning a summer-y/spring-y wedding involving daisies. The place we went to look at is in the middle of a historically accurate, reproduction town. We live in North Carolina, so cute little antique-y places abound, but this place is close by and full of charm. The only downside is that it is TINY and there is no way we could fit even OUR family inside the little chapel, let alone family AND friends. So, if she does go with this location, we’d have to do it outside, which is absolutely perfect. The place is so cute. I would be tempted to use it if Jason and I ever get married, even though I would like a winter wedding and the place is closed in winter. Maybe a good talk with the owner, and I could still book it….. The chapel is tiny, but absolutely stunning. 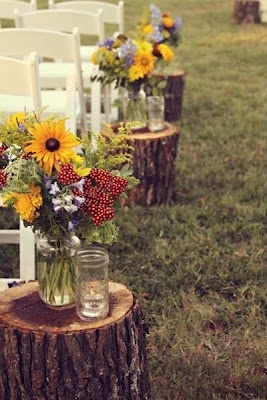 It would be perfect for any wedding with a vintage, bohemian, or rustic feel. 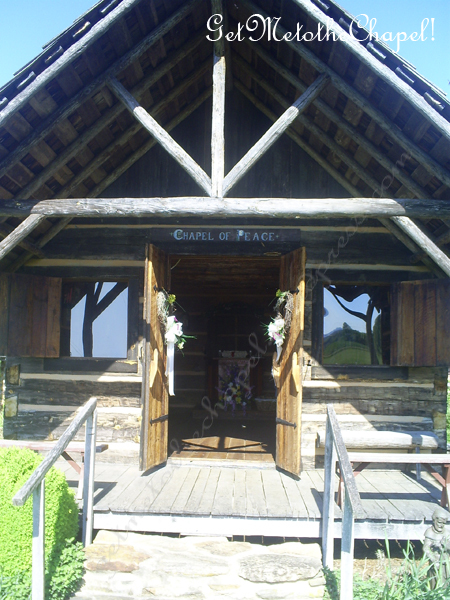 A shot of the front of the chapel shows that the “Chapel of Peace” as it’s called, has a small front porch area that is large enough for the ceremony. 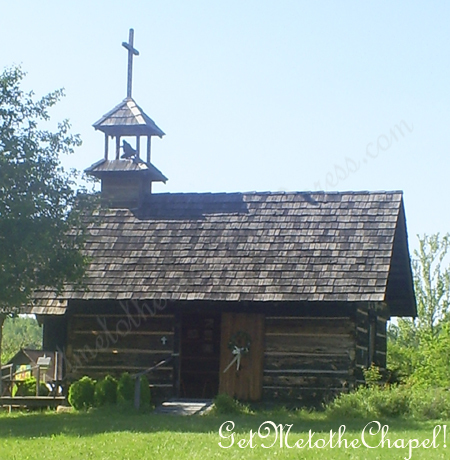 If you would like to have your wedding at the chapel but still have it outside, guests could sit out in front of the chapel while the vows were said on the front porch. 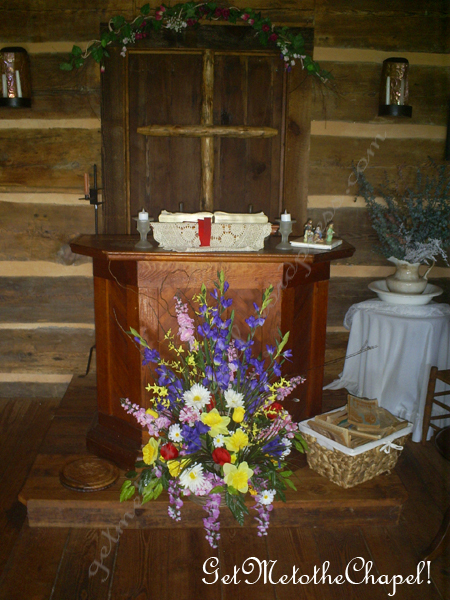 The decorations seen here are the ones that stay in the chapel as part of the decor, but of course, they could be removed for your ceremony and replaced with what you have. Isn’t it perfect for a vintage/bohemian wedding!? I wish I would have gotten a photo of the seating. They are simple benches made of logs that have been cut. Not much seating, to be honest. You could probably only seat about forty people. My aunt has mentioned that she definitely wants to use yellow in her wedding, so I put together some palettes that could work for her (or you). 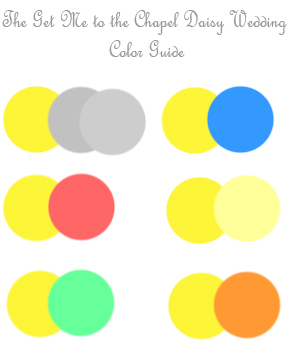 I am a big fan of the yellow and gray palette, but I also like the yellow, blue, and white palette. I saw a wedding using the yellow and pink and the yellow and orange palettes, and the yellow and soft buttercream palette is really simple. The yellow and mint is something I thought might go well for a bright theme. After all, not all brides are going to use the classic white and yellow daisy like my aunt is. The Gerber daisy is another big one that is being used. I tried to put together palettes that were easy to adjust. All the colors could go lighter or darker and still look nice. I found a VERY CUTE aisle decoration idea on pinterest earlier. Another good idea for centerpieces, huh? Simple and cheap. And I love the mason jars. You could also do tin cans filled with daisies and baby’s breath. Cute! As for the bridesmaids and the bride’s dress, I think simplicity would go really well with the theme. My aunt has expressed to me that she’d like to go that route, but other’s may like something a bit more fancy. So, I have put together an inspiration board!